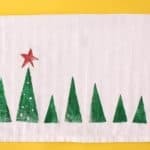 As I mentioned in the post about McCall’s awesome Christmas decorations, we made some pretty fun winter dioramas when she was visiting a little while ago and today I’m going to show you how to make them too. 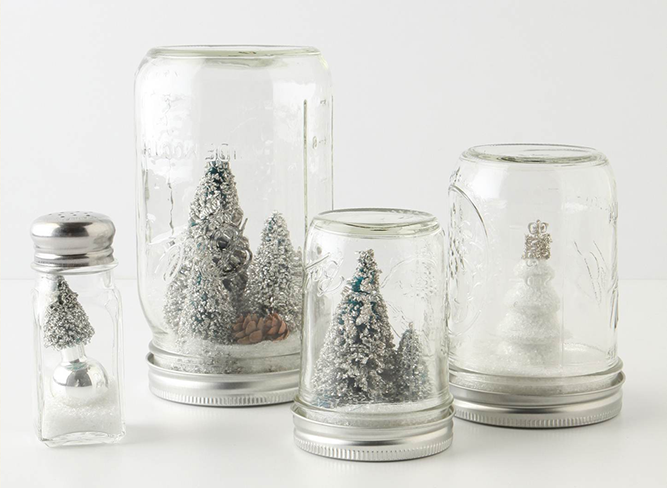 We were inspired by these “snow globes” at Athropologie. Super charming, but unsurprisingly, waaaaaaay overpriced at $18-39. 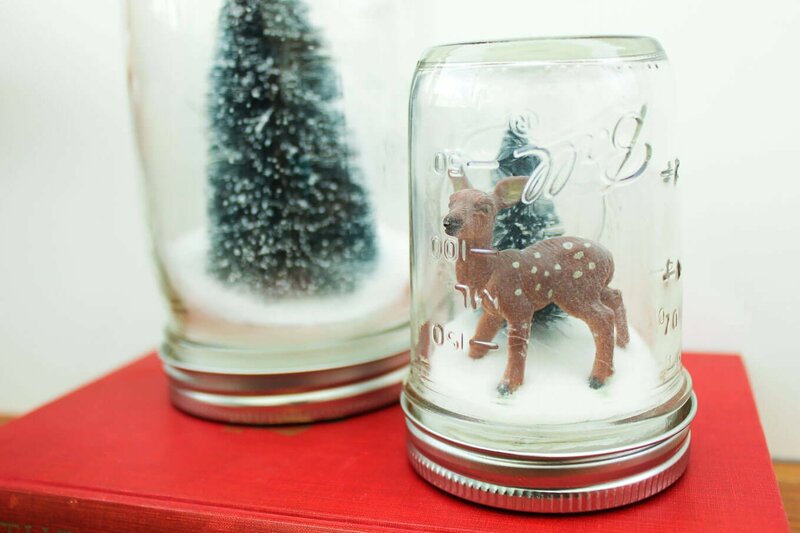 We knew we could figure out a way to make DIY snow globes for a couple bucks each. 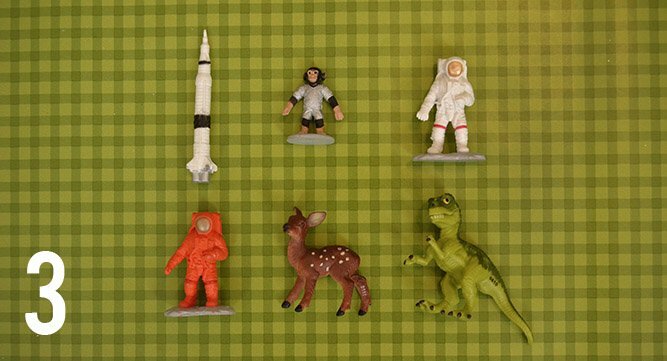 Although Anthro’s are sweet and simple, we decided to make ours a little more quirky by adding some fun plastic toys. 1. 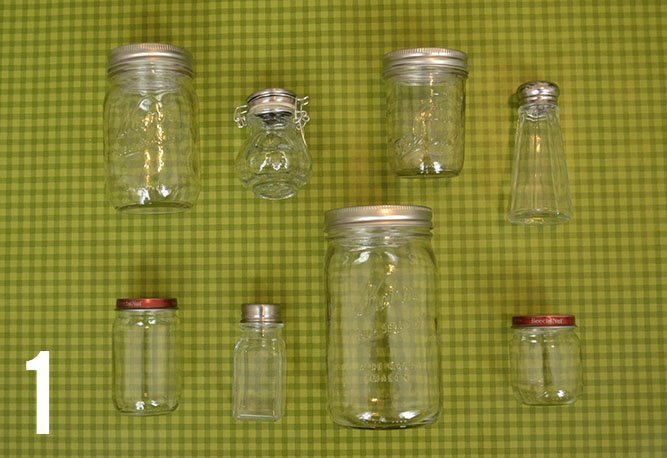 A variety of jars. We used small mason jars, salt and pepper shakers, jars from baby food and a couple thrifted jars too. 2. Trees and winter shrubbery. The trees are available at Michael’s and are sold individually and in a large pack of 20, which is what we bought. (If nothing else, we’re ambitious.) 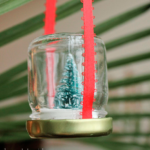 Pine cones are a great alternative to trees, although you need a pretty wide mouth jar to make them work. 3. Toys! These are from Michael’s, but you could find something similar at Target or Walmart. I also picked up some mini Christmas lights and candy canes to glue in the hands of some of my toys to give my snow globes a more festive feeling. 6. (Not pictured) Foam core or cardboard to boost the trees up in the jars. We picked up foam core at Dollar Tree. 7. 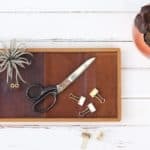 (Not pictured) A hot glue gun. 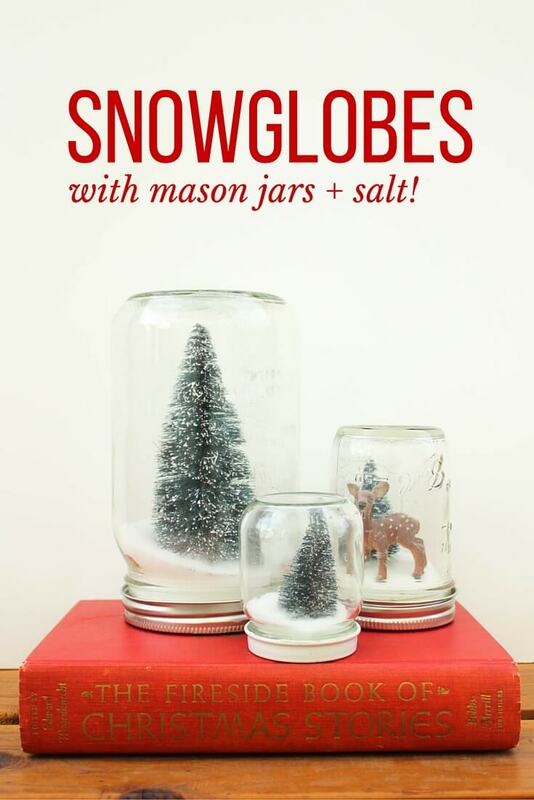 Or if you’re doing this with kiddos, Tacky Glue and a Christmas movie to watch while it dries. Okay, let’s get started! 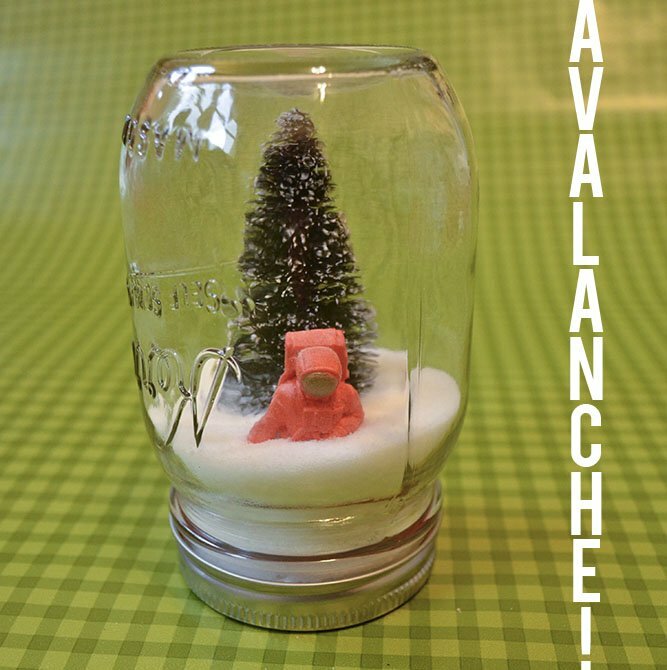 Put your tree in your jar to see how well it’s going to fit. In many cases, you’ll need a foam core “booster seat” to prop it up high enough that the lid isn’t covering too much of the tree. 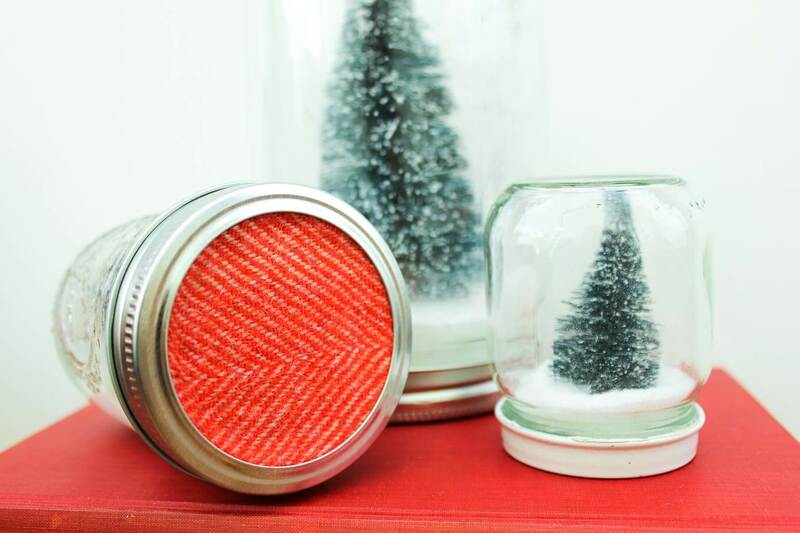 If your tree is drowning in your jar, cut a few circles that are small enough to fit in your jar lid and glue them together. Then glue your stack of foam core into the lid of your jar. 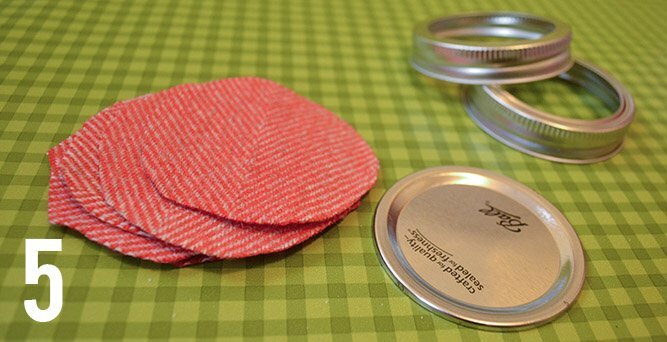 This is also a good time to glue your fabric to the lid of your jar if you’re using a mason jar. Now it’s time to plant the tree in it’s new home. Glue that puppy straight to the stack of foam core you’ve created. 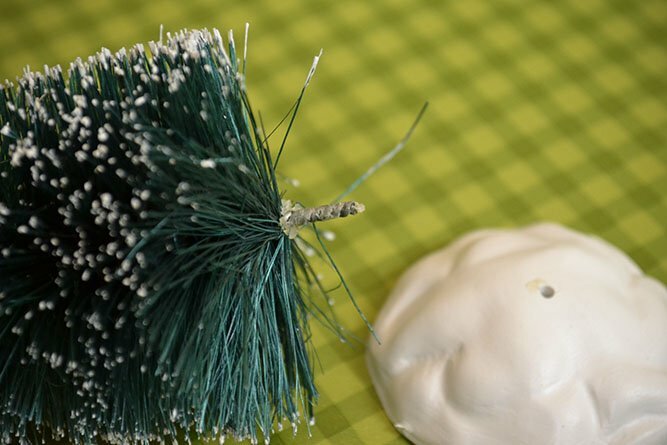 In some cases, you may want to remove the base of the tree and poke its trunk straight into the foam core with a dollop of glue. If you’re adding toys in your forest, glue them in now too. Time to make it snow! Like I said, it took us a bit of experimentation to figure out how much salt we needed in each jar. When it doubt, err on the side of less. It can become quite a blizzard before you know it. 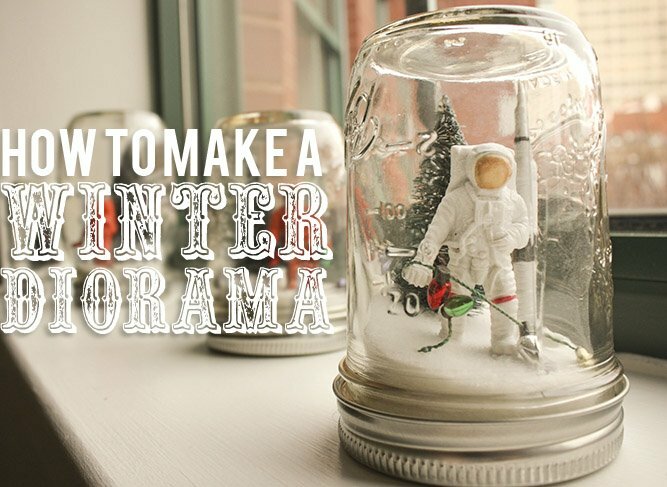 Now just screw that lid on and you’ve got a cute little winter diorama. 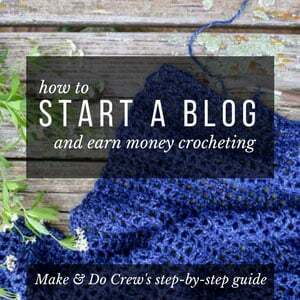 I’ve decided to show some “behind the scenes” action of more of my projects, since often all you see on blogs is beautiful shots of the finished product. So if you’re an anti-mess sort of person, you might want to stop reading right now. 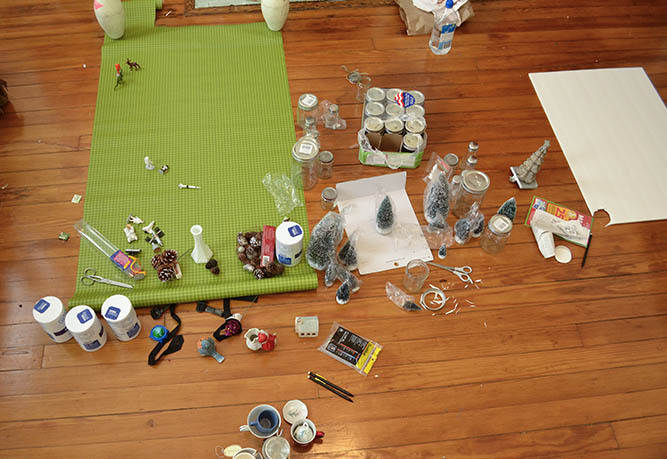 For those of you who aren’t, here’s what our DIY snow globe workshop looked like mid-project. 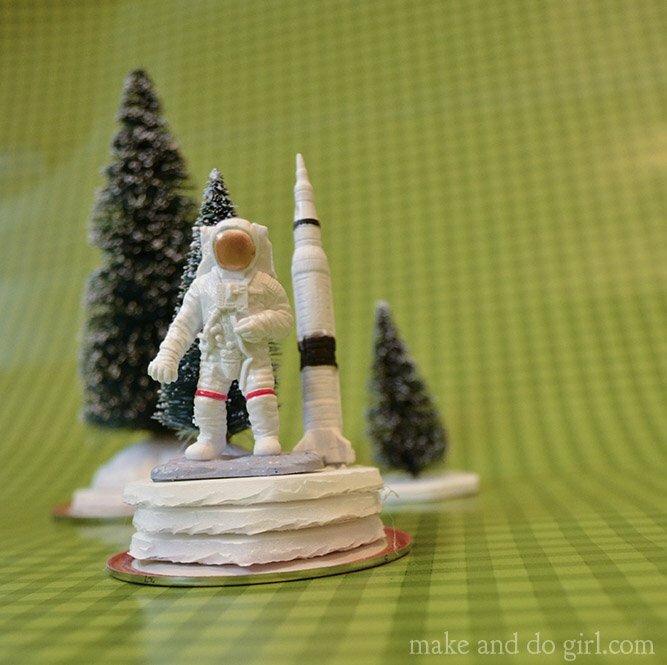 I hope you enjoy your winter dioramas. 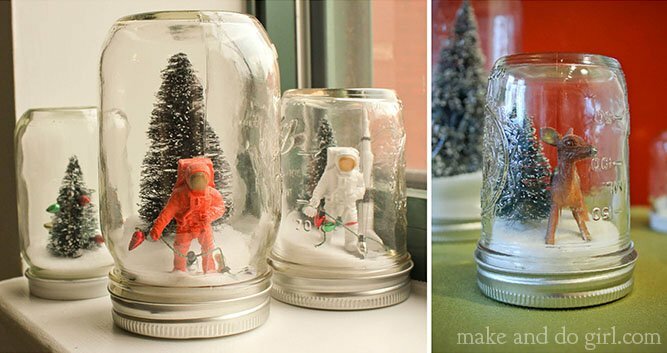 McCall and I learned that anything looks cute if you put it in a jar with some “snow,” so get creative with your winter scapes. There’s no wrong answer! i love these! 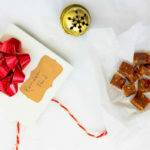 they are soo cute, and look easy-ish to make. i love my pink sparkly tree! No one deserves a sparkly pink anything more than you, Jame. Glad you like it. Looks like all that practice in elementary school is paying off!! Very cute. I like the jars way better than a shoe box. I may have forgotten to mention in the excitement of receiving one of these gorgeous little pieces of craft genius, that Diorama is one of my favorite words. Miss you!! Me too! And the opportunities to use it as far too limited! Hey Amber, I’m so glad you found it helpful. I can’t wait to set up my little snow globes again this year (just as soon as Thanksgiving has it’s proper moment in the sun!) Good luck! These are the BEST! This is also the best explanation I have found on the internet. Thank you so much! So these snow globes don’t have the snowing effect right? Just looks like they already snowed? Do you know of any way to make the snowing effect happen? That would be really cool!